What types of art historical, critical and contextual modes does the internet support? How have discussion lists changed the way we generate art knowledge? How far have we come since the early lists in truly democratizing art discussion and creating alternate contextual practices? What are some of the valuable new experiments being staged in the critical exploration of the arts? What impact does all this have on the future of the art history book? Work in a manner (publicly and online) that is more closely aligned with the practices and platforms the book will explicate. 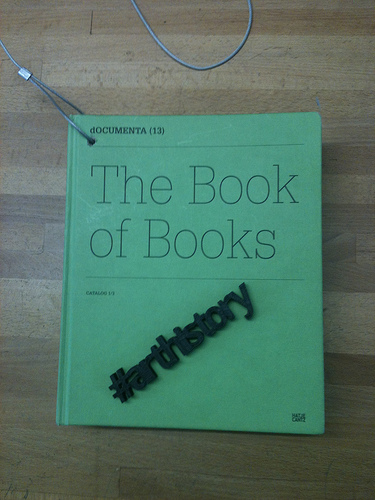 Coordinate the creation of a robust online archive on the history of online art discussion. For example I want to revisit the history of lists, on a list, and make sure many of the key discussions and actions that have shaped its history are identified, linked to and discussed. This will generate a sort of live art history book on discussion lists and the archive will exist as a permanent counterpoint to the eventual print-published text of Art History Online. In the first week I shall begin with the origins of discussion lists. Who started which list, where and why and what were some of the posts that established the list’s reputation? I will draw out some of the history that isn’t already described online and give list originators the opportunity to reflect, some years later, on what happened during these times. Then I will go on to ask people how they might theorize art discussion lists: as artistic or political statements in themselves? As living documents or performance spaces? As ways of hacking the systems of art making and contextualization? This month-long discussion is conducted in association with CRUMB and Arts Future Book, an experimental academic book series investigating the future of the arts book. To take part, sign up for the New-Media-Curating list, follow me on Twitter or run your own con-current discussion and share it with us. Looking forward to reading more about this project! I am interested in the quantitative approach to art history. The advent of Internet allows for much larger compilations than ever before. To my knowledge, few blogs about art history are discussing this approach. For instance, there are numerous on-line resources for art historical research in every country, but up-to-date comprehensive reviews are apparently missing. Every researcher has to do it by him/herself again and again. What a loss of time! I created a map for ‘Art in Britain’ and I got some positive respons about its usefulness, but I have not heard about similar maps for other countries.